...that my Sunroom would be the first to change with the seasons. Sorry you have to see it so often, but it is just my favorite part of my house. to change them out each month. just really gets me in that festive fall mood. Had to change out the wreath and ribbon too. Another one of my favorite fall quilts. This one is really old. I bought it in Atlanta 20 years ago. After Halloween, this one will go on the settee. My three little white squash. Love these old orange garden tools. Mums in an old wire fry basket. Vintage orange teapot from my recent finds. Baker's Rack all dressed for fall. Little Japanese Apple Jam Pot. Love these old Twining Tea tins. My favorite, Angel Vine, in a small vintage pitcher. Very old birdcage with a naughty little crow. a little early for Halloween. Here's look'n at you, Kid! 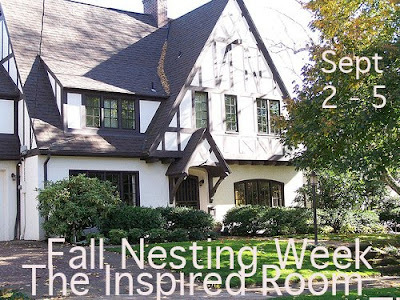 This is Fall Nesting Week at The Inspired Room. I'm doing posts that celebrate the change of the season. So for me, part of that is the change of decor. Hope you have fun decorating your favorite spots for Fall! Yippie for fall nesting week and the way you are changing seasons in the sun room. All those lovely little touches add up to a sweet room to enjoy the sun. Hope you are having a nice bit of indian summer. Love your sunroom! If I had one I'd just stay out there all the time. Your wreath is perfect and the quilts you use are so cozy. I've always wanted to use quilts in my decorating. Your quilts are so pretty. I live in Lancaster County, PA so I notice quilts..its one of the things we are known for. I love your orange gardening tools, too. I wasn't in a Fall frame of mind yet (it's over 100 here still!) until I saw your lovely photos. Thanks for the inspiration! Wow, your sun room looks absolutely gorgeous all decked out for fall! Thanks for the inspiration. OK, that crow gives me the creeps! I think you should turn him over to Miss Jenkins and Miss Wrigley for a little batting practice! Just beautiful. It all looks so inviting. Makes me want to sip some cider and where are those donuts? You know how I love orange;)!!! What a fun space...it sounds like you have a lot of fun with it! Love your fall whites with all of the rust and love your *rusty* attitude! You are such an inspiration! I never seem to have time to change things around for the seasons...it's enough to get Christmas done..don't get me wrong I love it...maybe it's called time management..hum..Anyway, thanks Debra for another inspiring post. You're putting me in the mood. I can't wait for fall to move in! I'd love to have your sunroom to play in and with. Hi Debra! is that a mirror on the door? What a great idea! LOVE it!!! What a beautiful sunroom...and its decorated so wonderfully!!! Very pretty sunroom. Love the quilt and it looks like your cat loves it too. They always find the best spots to snooze. You are all done decorating and I haven't even started yet. Oh, well maybe next week. Nice to meet you through the Inspired Room. This post is so cozy, I love it! My grandma had one of those apple jam pots, you bring back some very warm-hearted memories for me showing that lovely piece of yours here. Miss Jenkins is just lovely, it's so nice to see animals enjoying their happy homes. As you can tell, this post speaks to my heart. Happy week, love your style.